Thanks goes to Dan Driscoll, our fearless club leader, who put this ride together and arranged to have our club Challenge kickoff BBQ at Pro Moto Billet in Nampa. A thanks also needs to go out to Lynn Hodges, owner of Pro Moto Billet, for hosting us and giving us a tour of his facility. Anyone who uses his specialty products knows what excellent quality they are. I, for one, speak from personal experience. Our ride from Big Twin to Pro Moto Billet (11461 Lone Star Rd, Nampa, ID 83651) was via the back streets. The entrance to Pro Moto Billet is quite impressive. Lynn renovated an old school, which at the time he purchased it was a children's home. He did extensive renovation to it and uses it as his family's residence. Mike Anderson was seriously eyeing this KTM converted to a snow bike sitting outside Lynn's residence. Upon arrival, we met about as many other club members already there as were in our riding group. Lynn Hodges, standing to the left of Dan Driscoll, was there to greet us. Lynn then took us on a tour of his manufacturing facilities that are quite impressive. The custom motorcycle parts are precision milled from solid aluminum blocks using computer programed robots. There is minimal human interaction, as well as very minimal human error. He uses a 3-D printer and digital scanning pen to create the custom parts and check them for specific fit prior to programing the milling robots to produce the finished product. Here is an example of some foot pegs that are in one of several stages of being milled. Following our informative tour, we sat down to our Challenge Kickoff BBQ. Ken Hunter cooked the hamburgers and hot dogs, and club members brought the side dishes. Thanks to Ken for his services. Some of the more adventurous club members tried out Lynn's specialty tetter-totter that raises you 12-15 feet in the air. Lynn is holding down one arm of the teeter-totter so the person closest to him can get off. Can you see the concern in the other person that he might be dropped? He wasn't, and both exited without incident. During the BBQ, Michael Hardy handed out the 2015 Challenge bandanas to those who had signed up for this year's Challenge. They are a lively color purple this year. Chuck Scheer printed all the Challenge bandanas and T-shirts this year. I think the quality is superior to what we have had in previous. Thanks to Chuck for doing such an excellent job. You can see one of the bandanas in the next photo. 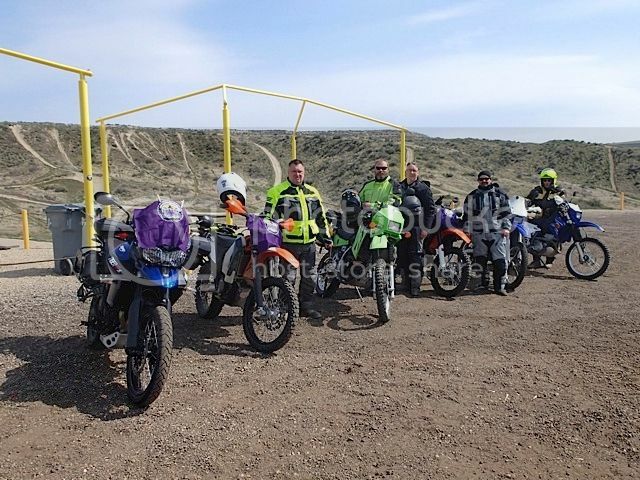 Following the BBQ, a smaller group of us - led by Michael Hardy - did a loop around Lake Lowell on our way to Pickle Butte Riding Area, Challenge Site #-4b. If you haven't signed up for this year's Challenge, I encourage you to do so. Go to our website at this link to do so. Copmpared to previous years, this year's Challenge has a lot more variety in the types of places you will visit and the option to choose the type of ride level with which you are most comfortable.